This pumpkin ale mac and cheese is (obviously) intended for inclusion in a Halloween feast. So I think that its other name can be Halloween Mac and Cheese. Totally legit. 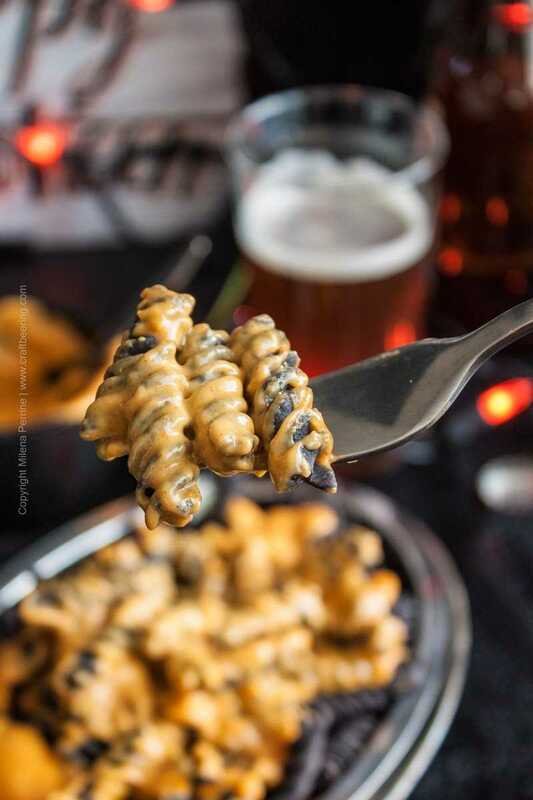 The black rotini, the strikingly orange cheese sauce, the gamut of flavors dancing together in this seemingly simple dish. Once again we reached out for a pumpkin ale as an ingredient. ‘Tis the season after all. Pumpkin ale is just so perfectly suited for a cheddar beer sauce with generous dashes of smoked paprika and turmeric for extra flavor (but mostly for color intensity). Not using pumpkin ale will lead to the loss of its characteristic pumpkin spice flavors which come together so well with sharp cheddar and the smoked paprika and turmeric coloring agents. So you will have to add some actual pumpkin spice. Just be careful to not overdo it. You want hints of it, not to make it the star of the show. When drinking pumpkin ale the aromas and taste of the spice can feel overwhelming (they do to Chris and I). When using the ale to cook with the pumpkin spice becomes much less intense, even elegant. The real loss in not using pumpkin ale however is concentrated in the loss of the delicious and deep maltiness the ale contributes to the sauce. This cannot be made up for in the non-beer version. Speaking strictly color wise, if you like to drink pumpkin ales (and not solely use them as cooking with beer ingredient) do pair this fun dish with one:) These ales frequently display deep orange/amber hues perfectly complementing Halloween decor. Of course, you could also go with a pitch black Schwarzbier. Joking aside, both styles of beer will support the flavor profile of our pumpkin ale mac and cheese with their sweetness and carbonation to cut through the fattiness of the cheese sauce…After all, most beers pair well with most cheeses. To achieve maximum visual amusement with this Halloween pumpkin ale mac and cheese you must do the unthinkable. You must resist the urge to generously coat the macaroni in the cheddar sauce prior to serving. Doing this would mean losing out on the beautiful contrast between the black and the orange. Instead of tossing the macaroni straight into the sauce, drizzle some olive oil over them so they don’t stick together and serve with a generous side of sauce to be poured over the blackness. Once the visual contrast has been devoured by the eyes and they have feasted in their own right, the macaroni and the cheddar sauce can be united, both still very warm and bursting with flavor. As a last talking point – I know that you have been asking yourself – what makes the macaroni black. In our case the answer is black beans. I did in fact try to purchase squid ink colored macaroni, but was only able to find spaghetti or tagliatelle. Which could have worked beautifully, we could have used our pumpkin ale meat sauce (most certainly color enhanced with smoked paprika and turmeric) with black spaghetti or tagliatelle, but luckily I happened upon these gorgeous black bean rotini made from organic black bean flour. At Trader Joe’s, one of my favorite places to shop ever. So if there is one near you – they have your black rotini. 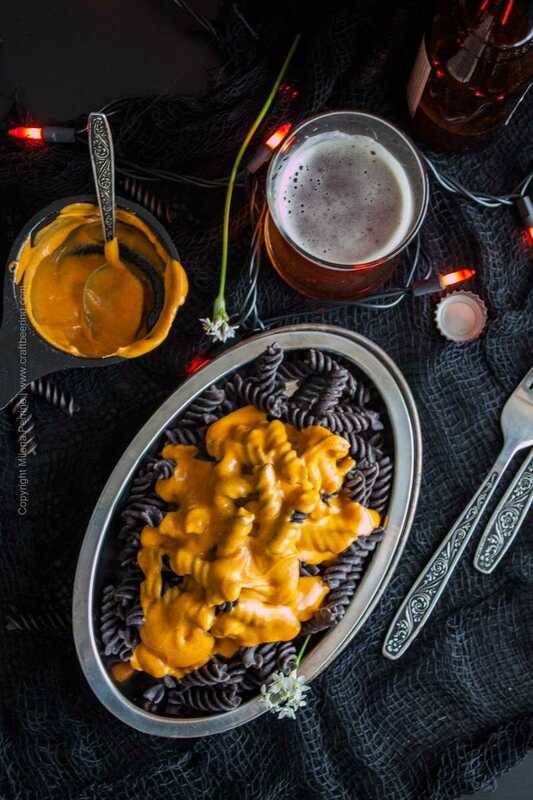 And with black rotini you pretty much need our pumpkin ale cheese sauce. Black and orange with amazing flavor profile! 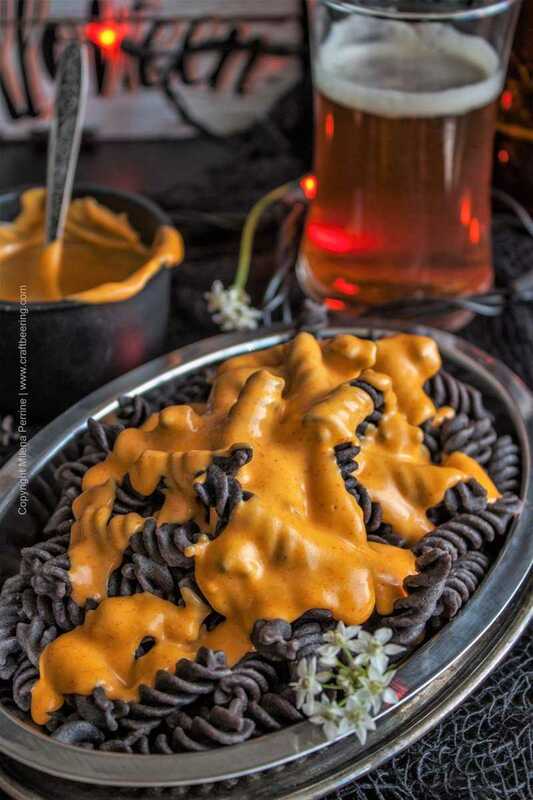 Delicious pumpkin ale cheddar cheese sauce, color enhanced with smoked paprika and turmeric and drizzled over black bean rotini for stunning visual effect. Non-beer based sauce version included. Shred the sharp cheddar, coat with the flour and set aside to reach room temperature. Meanwhile, bring about 4 quarts of salted water to a rolling boil and add the rotini to it. Cook for about 7-8 mins for al dente. Drain, return to pot and drizzle with the olive oil, then serve in desired dish. While the pasta is cooking, over medium heat melt the butter, mix in the additional 2 tbsp flour, the paprika and turmeric and stir to form a roux. Slowly add and mix in the pumpkin ale. Remove from heat and begin adding the flour coated shredded cheddar cup by cup, slowly stirring it in as it melts. Season with salt and pepper. Serve immediately in a small dish next to the pasta and drizzle it over it table side. Shred the cheddar cheese and set aside to reach room temperature. While the pasta is cooking, over medium low heat melt the butter and add cream, stir to combine well, wait until warmed through and hot to the touch and remove from heat. Add the shredded cheddar cup by cup, slowly stirring it in as it melts. Season with salt and pepper. Well, pumpkin ale is nowhere to be found in this small town. sigh… BUT I bought ale…. and I bought pumpkin spice. I even bought pumpkin… haha I am experimenting tonight to see how it works with the substitutes! Coming to your from a link on Nikki’s blog post for our Sentence a Day series. Oh, my gravy, this looks and sounds so savory and delicious. Alas, I live in El Paso with no Trader Joe’s but going to visit my daughter in Albuquerque so will put this on the Trader Joe’s list for while I am there. YUM! 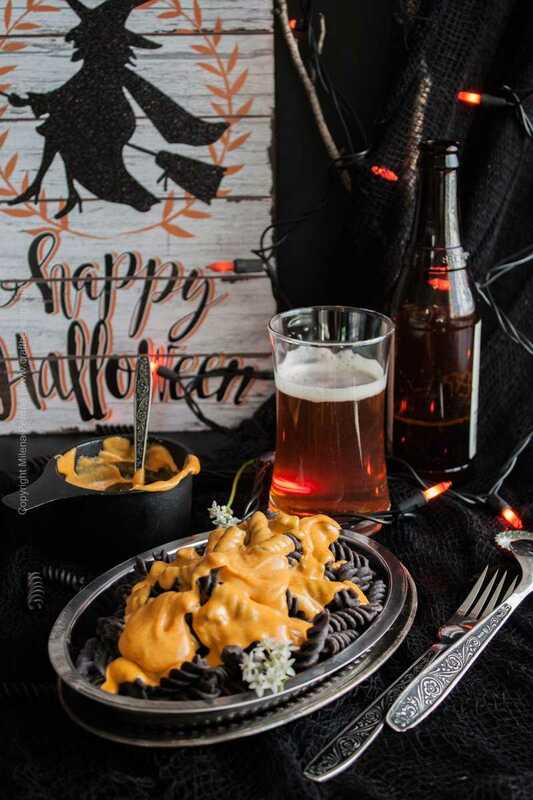 A fun presentation for your Halloween Pumpkin Ale Mac Cheese, looks like a great sauce! Thanks so much for sharing your post with us at Full Plate Thursday! Have a great week and come back to see us real soon! I need to host a Halloween party/gathering so I can make this! It looks amazing! Halloween food for adults! The contrast of the colours is beautiful. Only you could make mac and cheese look and taste gourmet, beautiful post. Mmm, thank you:) At his work Chris makes one with smoked pheasant and roasted corn that is pretty cool too:) But not orange and black so doesn’t make the cut, lol! Have a wonderful weekend Leanna! Milena this looks hauntingly delicious. 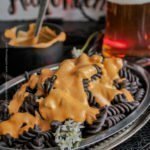 The black bean rotini so dark and mysterious, while the beer sauce vivd uplifting and rich a perfect recipe for halloween. I love the use of the pumpkin ale and could just imagine it in combination with the cheeses and the spices, goolishly clever, lol. Great job on this one just love it! Oh gosh, thank you so much Loreto! Happy Halloween to you guys too! Wow! This really is a striking mac & cheese. I love the contrast of the vibrant orange cheese sauce up against that wickedly dark pasta. I bet it would be a big hit with the kiddos at Halloween parties. Genius Halloween food! Got any recommendations for a couple of pumpkin ales? I’ve been chasing the dragon on a pumpkin ale I had about 15 years ago and can not find anything like it for my life. Still chasing though. It was not too sweet, not to pumpkin spicy. Just right. Fall in a bottle, really. Would love to find another really great one. Hey Jaxx, so you seem to be in the same boat as us…searching for a pumpkin ale to drink that we’d agree with:) So far cannot say that we have identified one. Not for lack of trying, lol. It is a delicate issues with the Perrines. Thank you so much Elsar! I love the orange and black contrast of the rotini and cheese sauce. Just perfect for Halloween time! I can tell that the kids will love this. I never knew that black bean rotini existed. I’m so glad you shared this recipe! Thank you! Spooky good pasta! And thanks for linking up at Friday Frenzy Link Party! I hope you link up again next week 🙂 PINNED! How fun! Love the color combination, and my kid would love that it’s mac and cheese! Thanks so much for sharing at the #happynowlinkup! 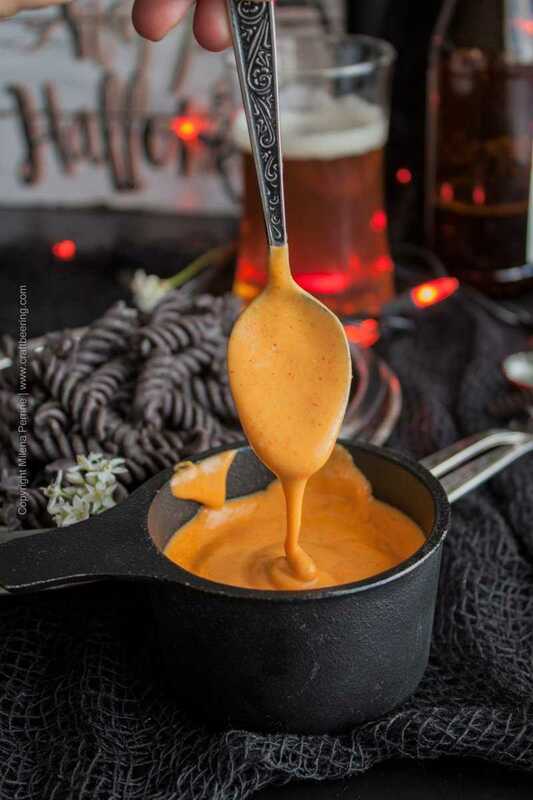 This cheese sauce looks delicious, and I love the Halloween colors! Too much fun! Pinning for later! I love the idea of ale being described as elegant! As is this dish! It’s a real show stopper, my friends! Thank you so much Dawn! I hope you get to make it soon, black bean rotini or not. It is really fun to dig into, I’ve promised my son he can have some on Halloween, we’ll do the kids version:) Cheers to you! Forget candy! (Did I just say that?) This is what I want for Halloween! OMGGGGGGG, that cheese sauce! I’d drink that stuff :). Adding this to my list of things I need to make ASAP! Lol, thank you. Kelsie – we shall definitely have our fair share of candy:) Promise!